Voltaire advised us to “Judge a man by his questions rather than by his answers” but, when learners question us, our answers are also vital. 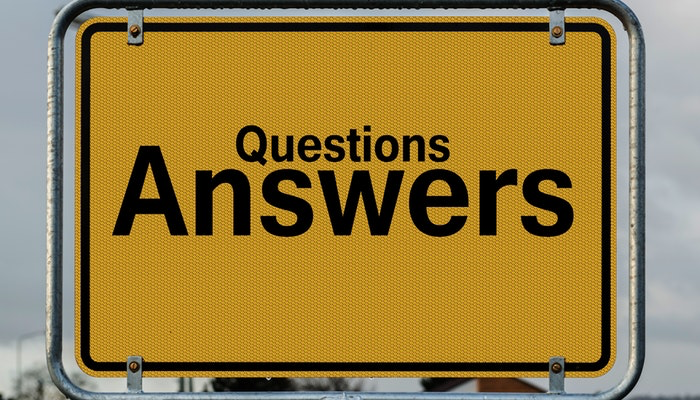 Our ability to answer learners’ questions can have a direct bearing on our credibility. But, importantly, being able to respond to questions is not the same as knowing the answers. Just as questioning needs to be a conscious and thoughtful activity (see https://www.mylampa.com/questioning-communicative-english-language-teaching-adults/), language teachers should also know that responding must be a deliberate act. When asked a question, we either feel that we know the answer or we are unsure of the answer. In either case, there are always responses that tend to lead to favourable outcomes and those that inevitably result in unfavourable outcomes. Even if we know the answer, we must take care not to be off-handed or inaccurate as we provide it. 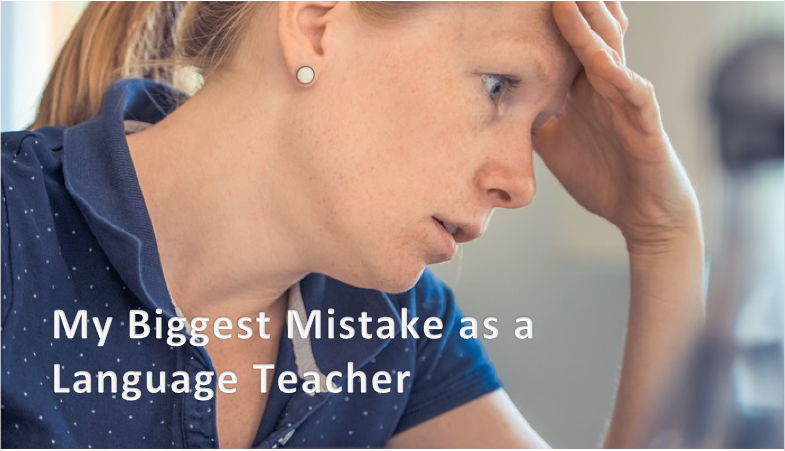 It was in my first year of teaching EFL when I had my first group of adult learners. One of the learners was a professor at the local university. He always seemed very motivated and inquisitive. One evening, after the lesson had finished, he approached me and asked, “What does irrelevant mean?” I quickly answered, “It means not important”. A week later he approached me again and correctly informed me that irrelevant does not mean unimportant. It means not pertinent to the topic being discussed. Naturally, as the native speaker and the English-language “expert” in the room, I became defensive and shrugged him off with a “Yeah, whatever”. That was the last time I saw him. I had lost my credibility. I learned my lesson the hard way. Knowing the answer to a question does not guarantee an appropriate response. Rather than blurting out the first thing that comes to mind or over-simplifying an answer, we must consciously attempt to give an accurate and intelligible response. 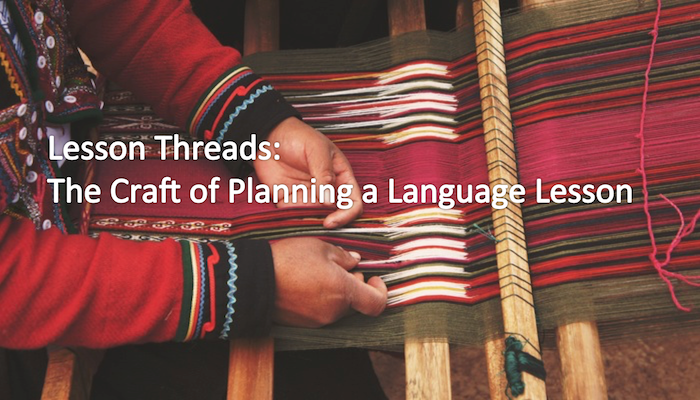 Granted, this can be especially challenging when we do not speak the learner’s mother tongue. Sometimes, however, it is more fruitful to withhold a direct response for the time being as we challenge the learners to arrive at the answer themselves or as we await a more appropriate occasion to introduce the theme. 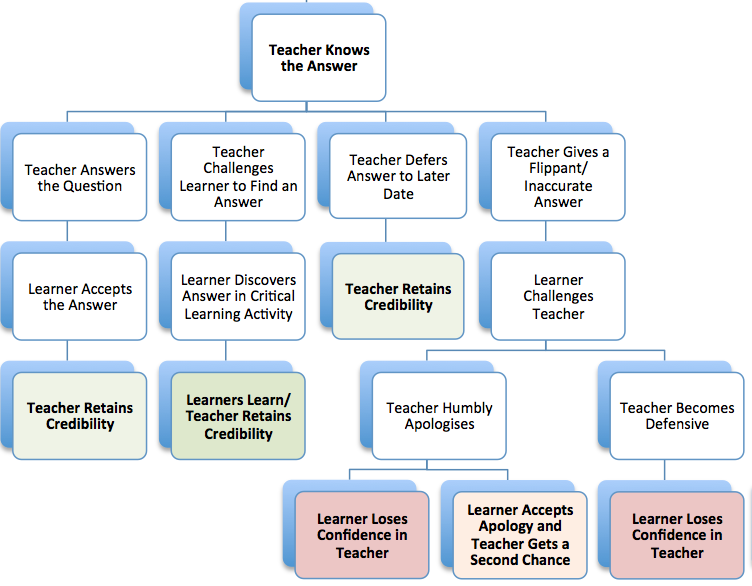 The flow chart below illustrates typical outcomes stemming from a teacher’s reaction to a question when he/she knows the answer. Alternatively, we may not be sure of an answer. No language teacher can be expected to have all the answers; language is an extremely complex art. Although experienced or well-schooled educators tend to have more answers, we all have more to learn. A teacher who is not learning is a teacher who is not paying attention to what he/she is teaching. Understandably, a teacher’s high level of knowledge tends to instil confidence in learners, but humility and honesty can make up for shortcomings in technical awareness. We should not get in the habit of faking it when we do not know an answer to a question. Deceit and arrogance eventually become apparent. Neither should we try to avoid difficult questions unless it is the wrong time to address them. Many adult learners rightly believe that they are participating in the course to find answers to their questions. When we don’t know an answer, the only viable option is to admit that we have never considered that question before and that it is an opportunity for all of us to learn. This, by the way, is how I have learned almost everything I know about the English language. After admitting our lack of knowledge, at the very least, we should make a note of the question, go home and do some research so that we can address it during the next lesson. Ideally, we should make the research into a group effort so that we can all discuss it together. 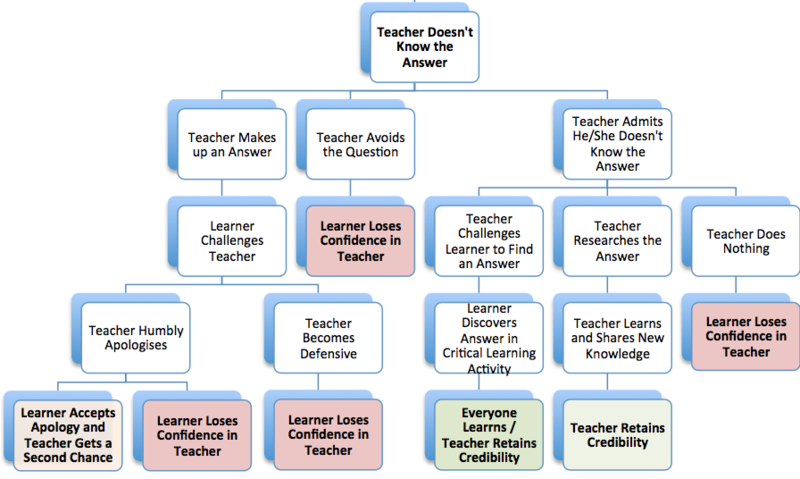 This flow chart illustrates typical outcomes stemming from a teacher’s reaction to a question when he/she does not know the answer. Questioning and responding are at the core of teaching and learning. The best questions come from experience, the best responses lead to new experiences, and experiential learning always yields the best answers. If you do not have a MYLAMPA.com account, I encourage you to set one up for your school or as an independent teacher – it’s FREE. If you already have one, check out the new updates! !